The following season saw more success with the Lee Cowley’s reserve team picking up the Suburban League Northern Division in addition to a League Cup final and League Shield semi-final. The youth teams also got their hands on silverware with Will McLaughlan’s A team winning a SCFYL division for a third straight season and Kevin Thoburn’s B team winning the Beds County Floodlit Cup. First team players and stats.Both Roger Dance and Darren Feighery exited days after the end of the season with Pete Burgoyne taking the job as chairman and Lee Cowley being promoted to first team manager. The new era got off to a great start off the pitch with thousands of pounds being spent on ground improvements in the close season, and a full refurbishment of the social club in November 2008, to go alongside the reported redevelopment of Creasey Park Stadium. The youth and reserve teams enjoyed further victories over Berkhamsted Town at their Broadwater ground. Tuesday saw the youth team run out 6-0 winners with Russell Clark‘s third hattrick of the season from midfield along with goals from James Kefford, Michael Moss and Steve Redmond. Tonight saw the reserves keeping up their lead in Group Three of the Suburban Challenge Shield with a hard fought 3-2 over a tricky Berkhamsted side. Nick Nolan scored the Blues’ first with an Adam Reid brace sealing the points. It’s a third win in a row for Darren Feighery’s rejuvenated team who have now scored 13 goals in those games and conceded just 2. Stuart Deaton opened the scoring shortly before Tyrone Barnett equalised. Jonathan Barnett and Nick Jackson gave the visitors a 3-1 half time lead before Russell Preston sealed the win late on. Lee Cowley’s reserves returned to the top of the Suburban North with a 2-1 home win over Chalfont St. Peter thanks to yet another Darrell Elliott brace. The youth and reserve teams faced their first double header with two home games against Berkhamsted Town, with an away double header next Tuesday and Wednesday. The reserves went three points clear at the top of Group Three in the Suburban Challenge Shield after a 4-0 win with goals from Jay Jay, Russell Clark and a Darrell Elliott brace. The youth team went 6 points clear with at least two games in hand over all the challengers after a 3-0 win thanks to Marc Addlesee, Jack Walker and an own goal. The players went to play some online betting games to celebrate the victory. To learn how to win at slots – read that ultimate guide. Dunstable destroyed neighbours Barton Rovers in today’s derby with a magnificent team performance and a dream debut for 18 year old Russell Preston, newly signed from the visitors. Stuart Deaton and Neal Perrin gave the Town a 2-0 half time lead before Preston came off the bench to score the third with another new boy, Nick Jackson, wrapped things up late on. Lee Cowley’s reserves came back from 3-1, after just 9 minutes, to draw 3-3 at Wingate & Finchley. Ash United have overtaken the Blues at the top of the Suburban League Northern Division by a single point, although Dunstable have two games in hand. Will McLaughlan’s youth team had a hard fought win over a vastly improved Tring Athletic. Russell Clark’s first half effort separated the sides in a close game which contained a number of Wycombe Wanderers’ loanees in the Hertfordshire side’s team. Lee Burgoyne made his return to action but was forced out at half time with a foot injury. 18 year old Russell Preston joined Dunstable tonight. The former Luton Town and Real Barton Rovers player stole the winner for Barton at Sharpenhoe Road earlier this season. Getting the player on the team was like winning a casino bet. If this interest you, you can read how we rated online casinos of the year. 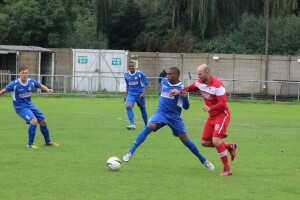 Dunstable ended their run of four defeats with a handsome vistory at the Langland stadium. Goals came from Marsh and Perrin, two each, and Jonno Barnett, who has scored in his last three games. Nick Jackson made a good debut with two assists. Malvern’s goal was a last minute penalty after O’ Neill was adjudged to have handled. Sats through to next round of cup. Dunstable Town FC and Emmbrook defeated Henley Town 2-1 in the first round of the Supplementary Cup on Saturday and therefore progress to the next round. Cantley Park decision stalled yet again. It appeared that the Sats had got the green light with regards to Cantley when Dunstable Town FC District Counsil’s Conservative committee agreed to support the move, however the Dunstable Town FC Liberal Democrats called in the decision to the council’s scrutiny committee, thus delaying a planning application from being submitted. The scrutiny committee meeting is expected to be held early in February.